Happy Garden Bloggers' Bloom Day! 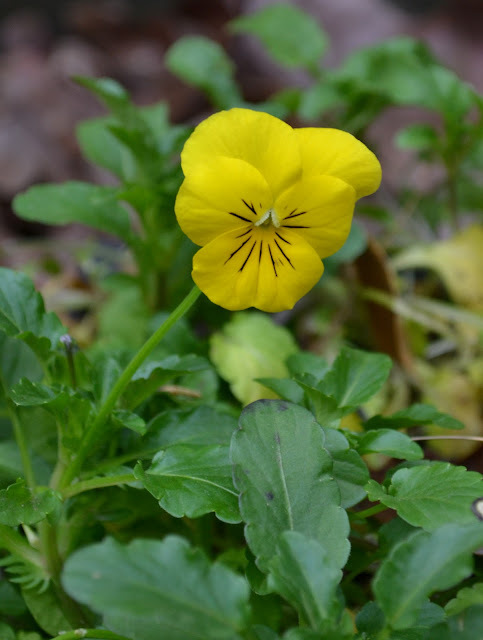 Finding blooms in our garden posed quite a challenge this month, as we've officially welcomed fall with not one--but two frosts in our zone 7b garden. Still, while most of the plants sustained quite some frost damage, a few trusty blooms hid from the cold. 'Rozanne' geranium, lurking under the overgrown lantana, survived the frost and continues a profusion of cheerful blue blooms. Thank goodness for this lovely little perennial. 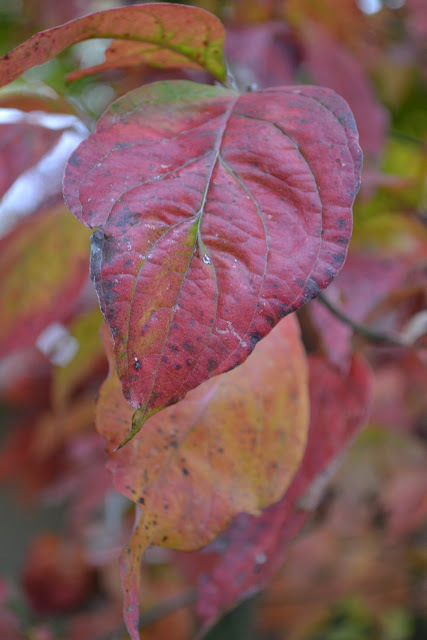 It's disappointing in the summer, succumbing to the heat, but boy--it works hard in the fall to liven up the garden. Most of the lantana blooms disappeared, but a few blooms remained on the lower, hidden-from-frost portion of the plants. They look tired, though, having worked hard to feed butterflies and hummingbirds all summer and fall. They deserve a rest. 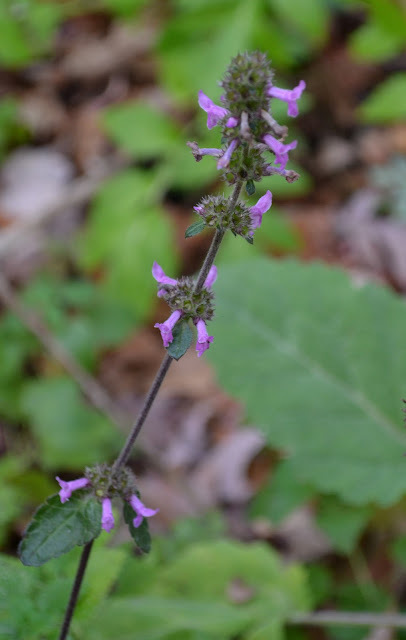 ...as well as the Mexican sage. Newly planted in the garden, I'm anxious to see how the sage performs next year. So far, it's been a stunning addition to the fall garden. Even a bit of gaura remains in the garden. A few whirling butterflies, ready to tuck their wings in for the season. Ah, but the camellias...I'm becoming obsessed with camellias. Honestly, I wish I had planted dozens of camellias throughout the garden. I also wish I had noted the varieties I planted years ago. Keeping records of ornamentals was not my forté when I began gardening long ago. 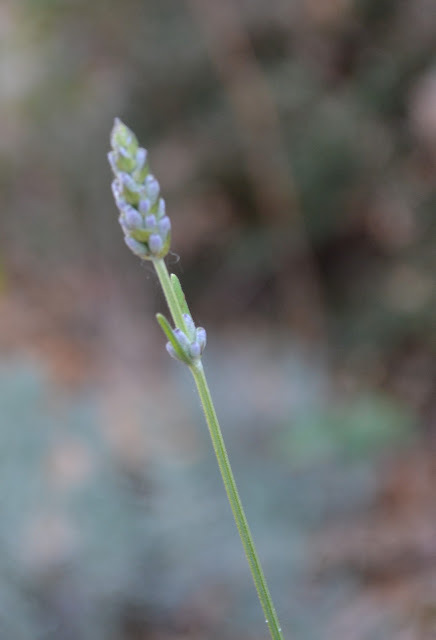 A few sprigs of 'Provence' lavender fight the cold, willing one more flush of blooms. I fear they're losing this battle. What the heck is happening here? An azalea bloom appeared in the front garden. This is not an Encore azalea. These bushes only bloom in the spring. Of course, the azaleas might be confused by the flush of blossoms on our daughter's cherry "birthday" tree. It blooms both spring and fall. In hindsight, I wish we had planted a normal, spring-only blooming cherry tree. Cherry blossoms in fall are just...bizarre. ...but the viburnum--wow! The huge, lacy blooms apparently enjoy the chill. 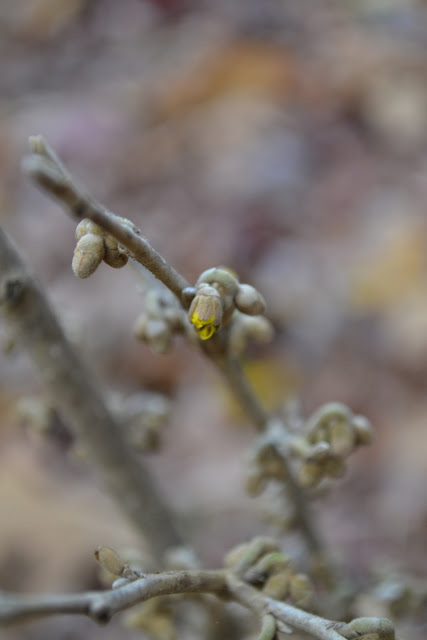 I'm thrilled about the newly planted witchhazel. I've been coveting it for awhile, and when I found it at a local plant sale, it followed me home. I'm so excited, I'm about to burst--just like these buds. Now, this Encore azalea is supposed to bloom now. Sadly, most of the blooms succumbed to frost. 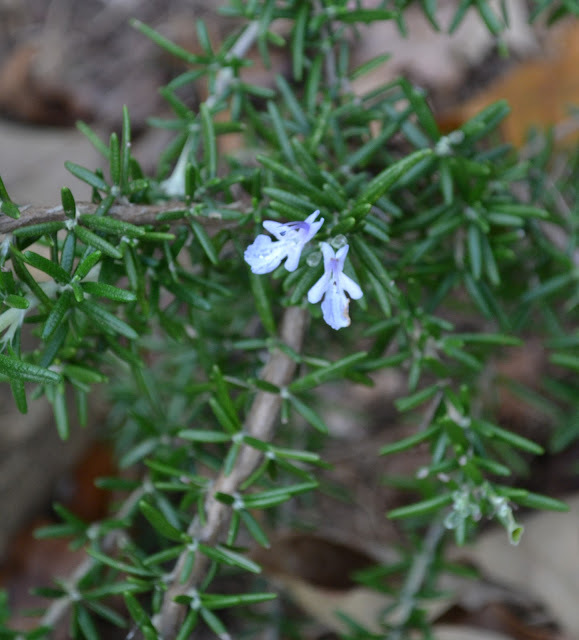 The tiny blue blooms of rosemary are rare in our garden, as we don't have much sun to encourage flowering. I'm always envious of the bloom-filled, enormous rosemary bushes I see in sun-rich gardens. Still, I love rosemary regardless of its lack of prolific blooms. It's truly my favorite herb. We've been harvesting sweet peas for a few weeks, thanks to a fall planting and some low tunnels to protect the kitchen garden from frost. 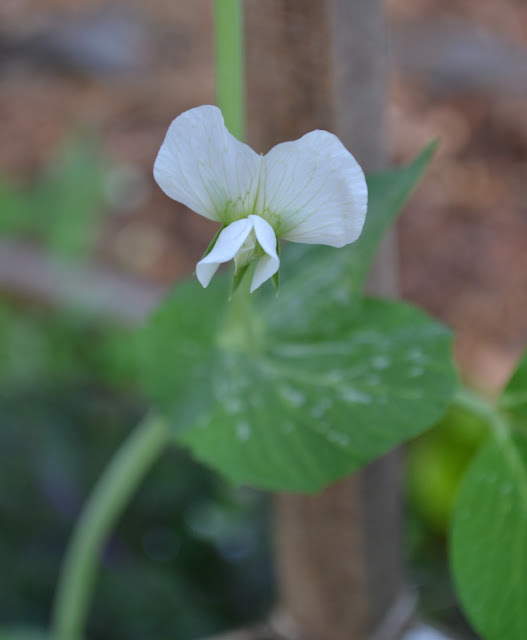 With the abundant blooms, I'm hoping we'll be eating peas for quite awhile. 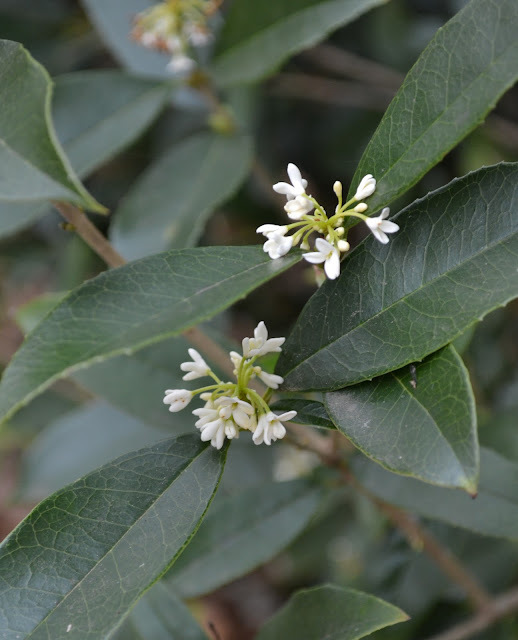 In the back garden by the pool, the tea olives' tiny blooms appeared. And soon, soon, my favorite winter bloom will appear--Winter Daphne. Just a little bit longer until its sweet scent welcomes visitors at our door. ...a few fall annuals remain. I've never been a fan of mums, but these mounds of cheerful yellow flowers found homes in wicker pumpkin shaped baskets. But pansies and violas will forever be some of my favorite flowers. 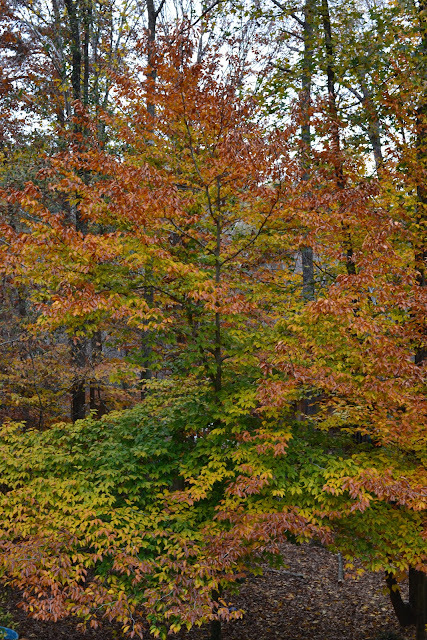 ...and from every window, the intense colors of the forest remind me to be grateful for our shady gardens.